Cyclopean skyscrapers, bizarre cults, strange foreigners and eerie alleyways - the cites of Arkham and New York stand on the threshold between the modern age and the Mythos. No-one in the NYPD speaks of it, but everyone knows that certain neighbourhoods are to be left alone and that there are worse things than criminals in the shadows. Only the foolhardy or the desperate follow the trail down these haunted streets. 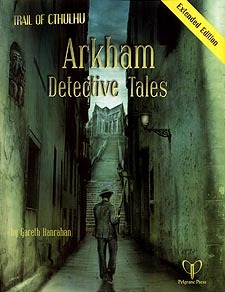 A new, extended edition with fully updated content and a brand new adventure set in Arkham. This volume includes five labyrinthine and spine-chilling mysteries for your Trail of Cthulhu investigators. The Wreck: The tramps steamer Star of Mauritius is discovered drifting in the harbour. Her crew are all dead or missing. What secrets lie within her rusting hull? Return to Red Hook: Thomas Malone led the police into the slums of Red Hook ten years ago, and dozens of officers died there. Now, the horror at Red Hook has returned, and once again New York's finest must risk their lives amid the crumbling brick tenements. NEW! The King's Men: Detective Thomas Tably commits suicide under suspicious circumstances. Papers found among his belongings put the investigator s on a trail that leads to historic Arkham and the dangerous Miskatonic Island cult.